Stoke have appointed Derby County boss Gary Rowett as their new manager. Rowett, 44, succeeds Paul Lambert who left the Potters following their relegation from the Premier League. 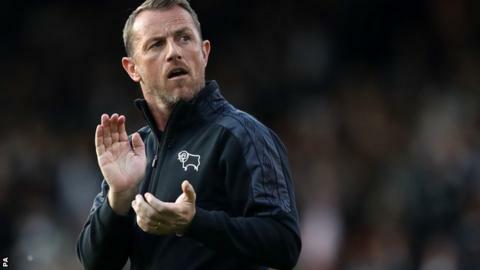 Rowett, who has signed a three-year deal, was linked with Stoke in January but signed a new contract at Derby after the Potters appointed Lambert. He led the club to the play-off semi-finals, where the Rams lost to Fulham, but asked to speak to Stoke on Monday about the vacant post. BBC Derby Sport reported that the compensation fee Stoke had to pay for Rowett was about £2m. "We are delighted to be able to move so quickly to secure Gary's services and we are now looking forward to working with him towards our objective of returning to the Premier League as soon as possible," owners Peter and John Coates said. Stoke's 10-year stay in the top flight was ended with defeat by Crystal Palace in their penultimate match of the season, with Lambert unable to save them from the drop after succeeding Mark Hughes in January. Lambert had 15 games in charge of Stoke but managed only two wins. Rowett began his managerial career in League Two at Burton before leaving for Championship side Birmingham City in 2014. After taking over with Birmingham 23rd in the table, Blues rose to 10th, which is also where they finished the following season, but he was sacked in December 2016 with the team in seventh. He was appointed at Derby in March 2017 and won 26 of his 60 matches in charge. The Rams said their search for a new manager was already "under way". "We wish to place on record our thanks to Gary for his contribution during his time as manager," a club statement added.